You can apply for the FREE GROUP LESSONS when you sign up for NYJL e-Newsletter. Please enter your email address and your name. 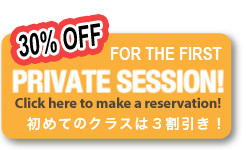 We will send you Japanese Trivia or Free Japanese class info about every two month. If you don't want to apply the lesson,please check it on the form. Please enter your email address and your name. *If you don't see any emails from us,please check your spam box. *We wil not use your personal information.